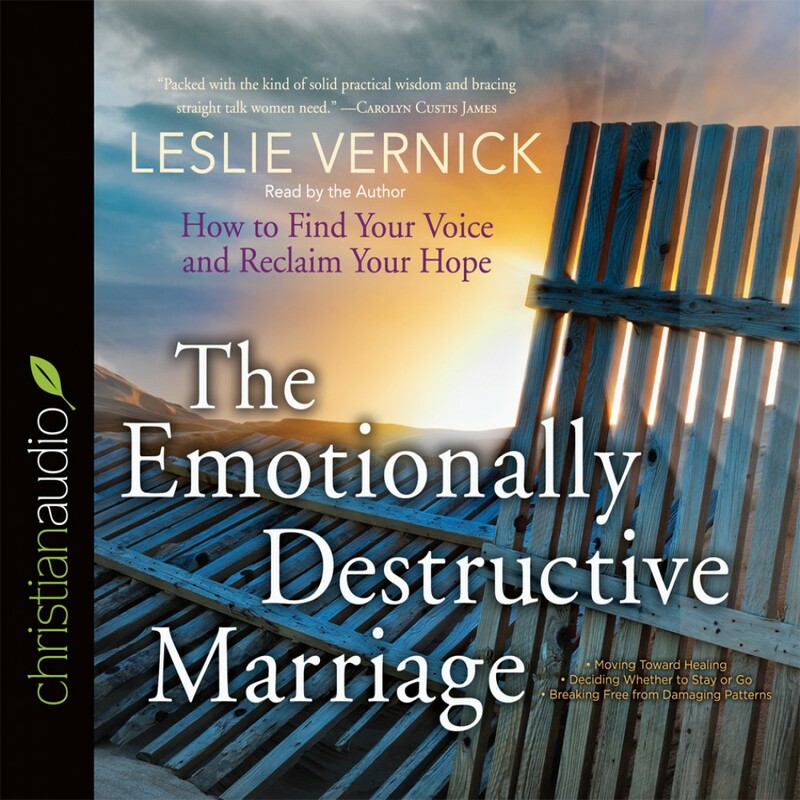 The Emotionally Destructive Marriage by Leslie Vernick Audiobook Download - Christian audiobooks. Try us free. The Emotionally Destructive Marriage by Leslie Vernick is a book devoted to help women in particular deal with marriages that have become destructive. It contains a wealth of advice for women to identify damaging behaviour, how to respond to criticism wisely and options to leave if the situation is not improving or even getting worse. It documents many cases with varying degrees of emotional and verbal abuse and possible solutions as well as pitfalls that make the situation worse rather than better. There are additional resources that can be accessed through the website to assist people as much as possible. That is one of the best aspects of this book, that the author has a great desire to ensure that these sort of troubled marriages are greatly improved and become the marriage relationship intended by the Bible. Personally, being a man, I found parts of this book very disturbing that men could be so cruel to people that confess to love and should be looking after not making their life harder. This is a book that I will hopefully never need but as the world is getting darker there are bound to be women coming into the church in these situations that will need help, which is when this book will be a great resource. The narrator was the author herself, which I think was important for such a troubling issue as marriage abuse because she could convey her message with the love, courage and emotion that was needed for such a sensitive topic. I thought she was quite easy to understand and the speed of the reading wasn't too fast for me to follow. This book is a must for women who are in destructive marriages where their husband is verbally, physically or emotionally abusive towards them. It would also be good for people trying to help these women, so they can give them good advice. This audio book was gifted as a part of the christianaudio Reviewers Program in exchange for my unbiased review of this work. More information can be found about this and other Christian audio books at christianaudio.com. Having grown up in a Christian family, part of a strong community of believers, I've heard and even given my share of marriage advice based on the Bible. Looking back, I see that some of it wasn't healthy or even biblical, but based more on a spiritual list of what we'd imagined a Godly wife to be. The problem with that list was it prioritized an ideal more than realism, and many women suffered needlessly, thinking it was "for the cause of Christ". This book put into words many of the thoughts that have been seeping into my mind about such advice lately, pointing out that emotional abuse is real, and that ignoring it or being a good enough wife doesn't make it go away. Beginning with an explanation of the difference between an disappointing marriage and a destructive one, the author clearly points out how to determine which you are dealing with. She then spells out what is present in a healthy relationship and a destructive one over the next few chapters, before launching into the practicality of dealing with an abusive marriage. Throughout the book, her explanations and advice are backed up with biblical references and spiritual understanding. She recognizes the misguided counsel that exists within some Christian circles and explains why this is not consistent with God's Word. Especially helpful is the information found in Appendix B, "Five Common Mistakes People Helpers Make". Not only would this book be a great help to anyone in an abusive marriage, but it should be required reading for every pastor, Christian counselor, or ladies minister. It is the most practical I've found in dealing with problem marriages, and I wish I'd found it years ago. Several circumstances come to mind when I've listened to a hurting wife explain what she's going through, distraught and tearful as she told her story. The practical checklists and explanations found in these pages would have helped define the level of severity of what was happening and outlined action steps for dealing with the problems. The author's website is full of extra resources that correspond to this book and to relationships in general. Dozens of free articles and videos provide relevant information, as well as her blog dealing with the topics of this book and relationships in general. She takes time to answer reader questions and deals with tons of sticky situations, such as all those special cases filling in the "Well, what if...?" question. I listened to this as an audiobook read by the author. A few minutes into the introduction I realized there was a lot of information I'd like to be able to reference for later use. I ended up taking notes throughout the whole book, outlining key points and the action steps for each chapter. Had I not chosen to do that, I would definitely have wanted to buy this book in print form after listening to it. It was necessary to rewind often, as the author read very quickly through some sections, and I had a bit of a hard time making out what she was saying. Something that bothered me as well was when she changed her voice to imitate someone speaking through tears or whining. It may not be an issue to someone else, but it began to grate on me after the first couple of times hearing it. Apart from that, her passion for helping hurting women caught in destructive cycles shows through in her voice. **This book was provided to me through christianaudio's Reviewer Program in exchange for my honest review. Useful information, but not what i was expecting.. I love listening to books in audio format, and was thrilled to discover that the author of this book was the narrator... I feel like its more personal when the actual author of the book is the one reading it to you.. In this case I do not feel like Leslie Vernick was the best choice as a narrortor.. At times it was hard to keep up with her because she reads really fast.. I found myself having to repeat a few sections just to get the words in.. When I first saw this book I was thrilled .. it looked like a useful marriage book that I thought would help my marriage.. I was surprised to discover it was a book that focused on Women who were abused..The author even specifies in the introduction that this book was written for woman only, and not men.. I thought that since the book was specifically written for woman it often seemed to bash men .. and i really didn't enjoy that. I have a good marriage although not perfect it is certainly not abusive.. .. I didn't really get anything out of this book.. but i believe there is a lot of useful information for woman who are struggling in an abusive marriage.. I was given the opportunity to review this book through christianaudio Reviewers Program (christianaudio) http://christianaudio.com .. Thank you christianaudio..